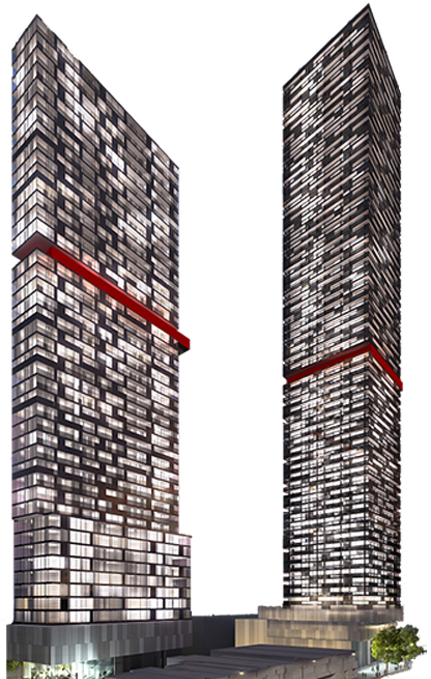 Toronto's first towers with direct indoor connection to Eglinton Subway Station and the new Crosstown LRT that will have 25 stations when it opens in 2021 and then eventually expanding to 61 stations. 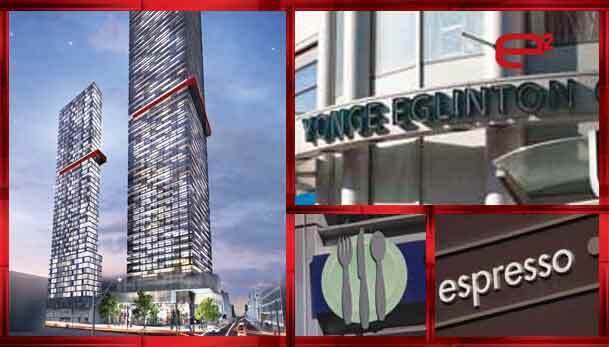 E2 Condos is connected to Yonge Eglinton Centre, offering direct indoor connection to all of the magnificent shopping & dinning at RioCan Yonge Eglinton Centre with over 60 additional shops and restaurants. 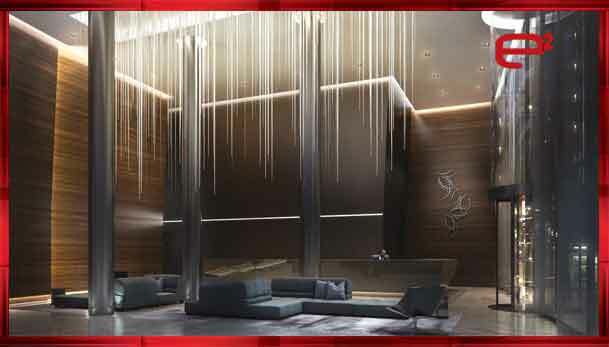 A luxurious 44 storey building that will be featuring over 450 units: 1 bedroom, 1 bedroom plus dens, 2 bedrooms, 2 bedroom plus dens and 3 bedroom plus den layouts. Premium features and finishes with innovative wide-shallow floor plans including desirable split 2 bedrooms. When E Condos at ePlace is completed it will hold 1m square feet of retail space and will be home to TD's new flagship office, PI CO and other convenient amenities. 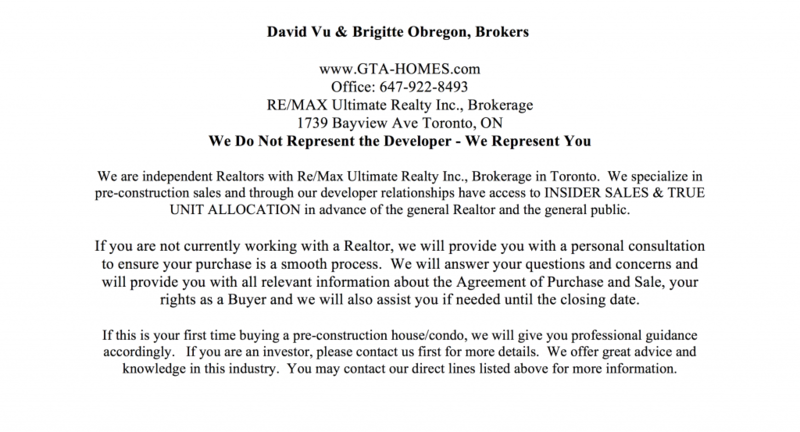 "Yonge Eglinton Average Home Price $1,401,837"
Toronto's most affluent neighbourhoods with an average median income of $147,862, it's almost double the Toronto median at $69,3329. When you live at E2 Condos you will find around you Forest Hill, Deer Park, Moore Park, Davisville Village, Leaside, Lawrence Park and Lytton Park. An ideal place to live for the educated young professionals and families, 72% of the population is comprised of families (2011 City of Toronto neighbourhood census). A central place, a hub for 79,000 daily transit riders. In 2015 foot traffic was 82,000 - it is projected to rise to 150,000 by 2025. 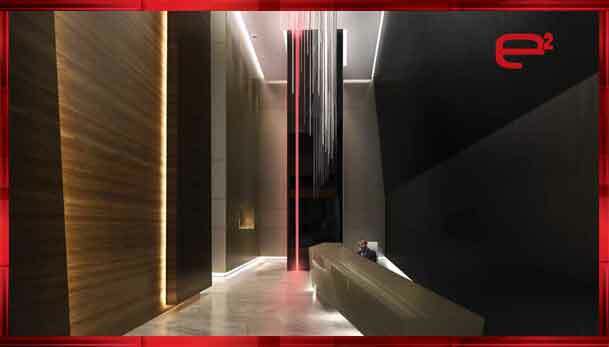 E2 Condos is the second instalment phase of the successful E Condo series, a joint project by Metropia & Capital Developments, along with architects Roy Varacalli and interiors by Mike Niven Interior Design. Presently in construction, they will be ready to launch this fall. 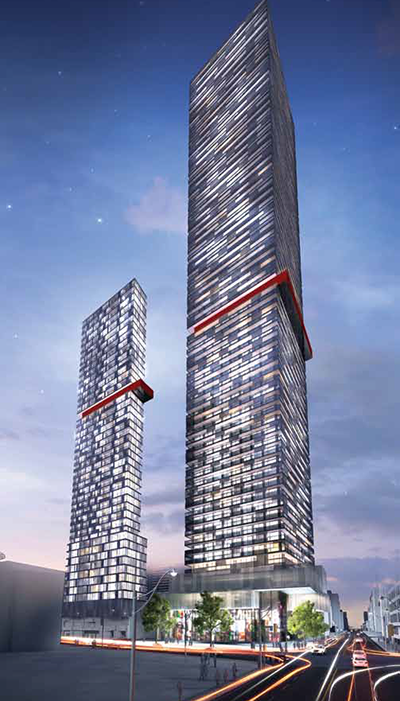 This northern structure will be stationed on the northeast landmark corner of Yonge and Eglinton in the Midtown Toronto neighbourhood of Toronto with direct access to the Yonge Eglinton Centre. This residential mixed-use, exclusive luxury high-rise tower will be touching down very soon at 25 Roehampton Avenue, soaring 44 storeys shadowed by its 58 storey sister--tower, elevating the prominence of this highly coveted neighbourhood. It will be receiving its first occupants by late 2017. The two E towers (E and E2) in this development will be anchored atop a three storey platform built around an open-like public piazza, along with street-level retail - tying the development in with the surrounding neighbourhood and streetscape. The proposal for this northern build calls for 450 units, inclusive of residential condo suites and 30 of which are replacement rental units. It is an irregularly shaped parcel of land, where the entire site has frontages along Yonge Street, Eglinton Avenue. The structures are designed with staggered balconies and varied densities of exterior divisions to add visual interest. The developers involved in these dual audacious and breathtaking development have raised the bar beyond one’s imagination. 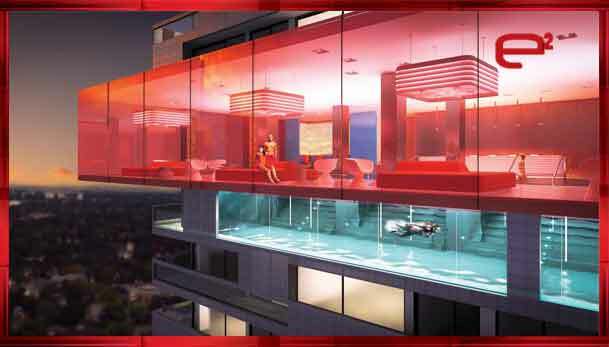 It entails a rare yet sensational looking complex featuring a cantilevered red glass-enclosed pool overlooking the city’s skyline, which will be both eye catching from the outside and a hot-spot for its residents. Being located at the heart of everything is usually a bonus, particularly when you are single and ready to mingle. E2 Condos is a visionary new live, work, play community. There will be a collection of suites styles being offered which include studios, up to two- bedroom dwellings, some with a den. Starting prices will start from the high $300,000’s, the floor plans will range from approximately 400-sq-ft., to 1,200-sq-ft. Anticipate each space to carry extended 9-ft ceiling heights, designer selected pre-engineered flooring throughout living areas, including the den where applicable and bedroom(s). The kitchens at E Condos Phase 2 will feature a quartz countertop, custom backsplash, exclusively designed kitchen cabinetry, upgraded material and hardware including a state-of-the-art European kitchen appliance package. Bathroom features will include quartz countertop, porcelain floor tiles, built-in deep soaker tub and full-sized stacked washer and dryer. Stay tuned for your invitation to E2 Platinum Access Preview Event. Be prepared to be amazed at E Residences, both towers will have dedicated floors with a range of indoor and outdoor top-notch amenities exclusive to its residents. 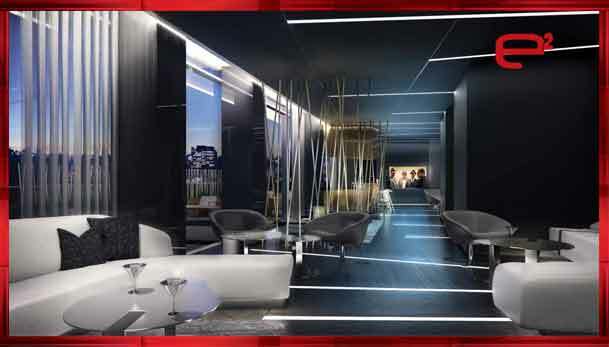 Starting off with the lobbies alone - will boast 20 and 30 foot high ceiling space and will feature a 24-hour concierge and provide security service for its 1,000+ inhabitants. Each space is thoughtfully designed and laid out making it desirable for anyone looking to live in a sophisticated urban oasis. It’ll posses a standard premium fully equipped gym facility, yoga studio, party room with separate dining areas and a fully functional kitchen, games room, theatre hall, lounge space, guest suite and the already mentioned, highly anticipated glass enclosed cantilevered pool that’ll jut out on the 31rst floor, accompanied by a deck, referred to as "E-Sky Lounges". 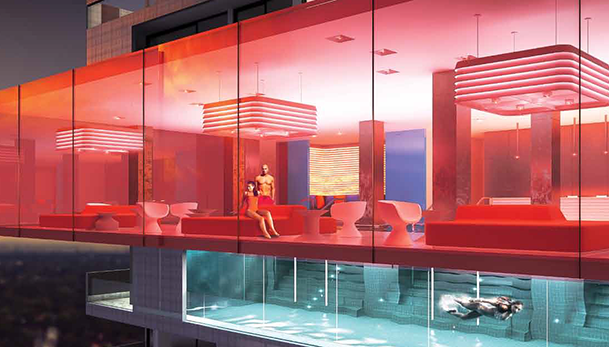 It will provide a lounge and chill-out area as well as offering pretty spectacular views of the city and much more. 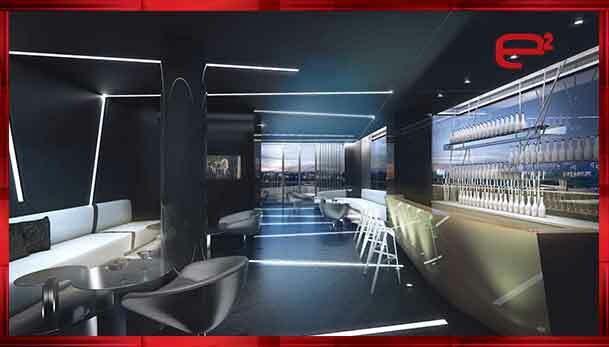 The outdoor space will consist of a stunning wrap-around landscaped terrace with barbecue stations, dining tables, bar and lounge seating-providing a fantastic area to entertain friends and family. In addition, the development is required to provide a minimum of 528 parking spaces in an underground parking garage. 56 of the spots are planned for non-residential use, 458 spaces are for residents and 14 car-share slots would be provided. No visitor parking will be scheduled. A limited commercial parking area will also be provided. 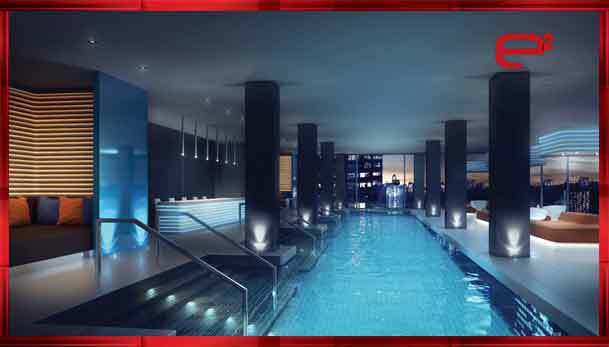 This’ll be one vertical city many will fancy and crave - welcome home welcome to E2 Condos. 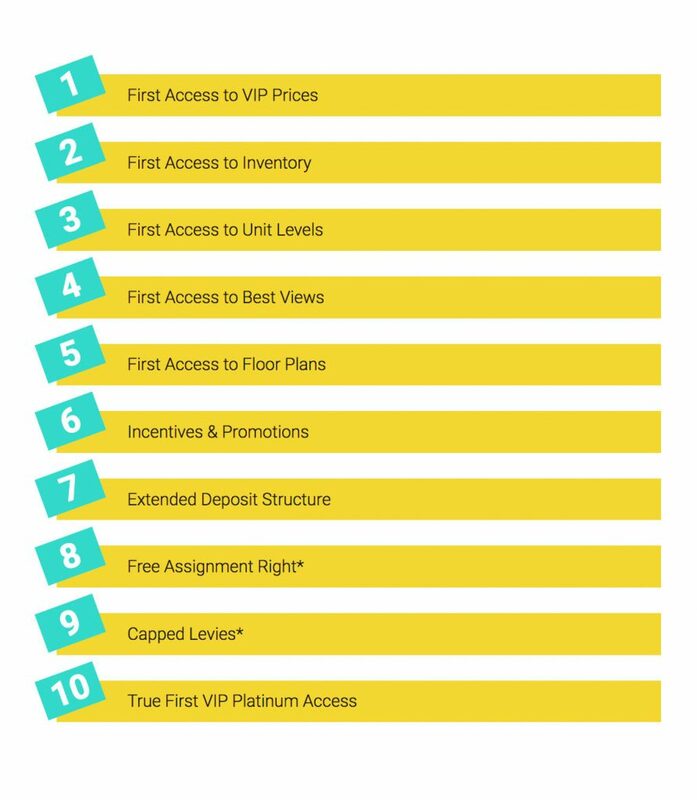 For more information, please register today for E Condos Phase 2 Platinum Access Preview Event. Serving the residents well are the plethora of conveniences this pocketed neighbourhood has to offer. E2 Condominiums has a walkscore of 98/100. It’s located at the core of everything, steps to public transit, schools, local parks, restaurants, pubs, entertainment facilities, grocery stores, retail and boutique shops, recreational options, movie theatres, other professional services, banks, places of employment, along with a lively, dynamic nightlife. Not to mention the utilization of an unparalleled underground access walkway to the Yonge subway, the new Eglinton Crosstown LRT and other corners of Yonge and Eglinton, without ever having to venture outside. How cool is that!. The LRT will be a major game changer for this neighbourhood quickly as it becomes a major hub once the line becomes active. This location is ideal for moving in and around the city and beyond. Many bus routes and subway access are all nearby. For those individuals who favour driving; most side streets will get you to where you want to go and entry onto the Don Valley Parkway via Bayview Avenue on-ramp is within a few minutes drive away, making it easy to connect to other major thoroughfares, albeit encountering some traffic congestion. One can't deny that everything will be within reach. 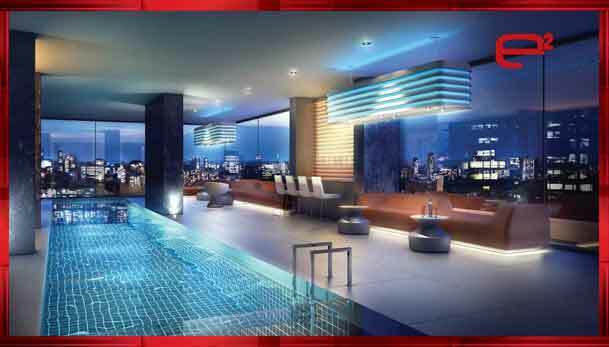 E2 Tower will definitely be the quintessential condo to purchase in. There is plenty of opportunity for investing too, as the units can be rented at high rates since the community has been voted the number one neighbourhood to live in. The area will prove to be a booming investment in renting out units, a location full of opportunities and a place that offers all of the perks of life. A chic neighbourhood, in which you will not only honestly find anywhere else in the midst of this ideal midtown setting. This is absolutely one of Toronto’s most colourful urban regions, why miss out and be left behind; be one of many who will make this their new civic address, as they bask in the satisfaction of having everything at their fingertips while maintaining a midtown address. 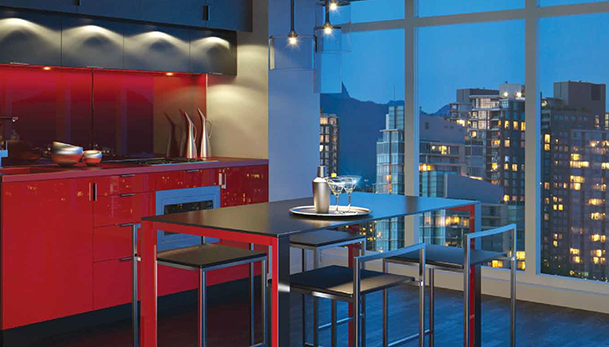 E2 Condos is also connected to Toronto's top 3 universities, University of Toronto, Ryerson and York. Direct indoor subway access makes it easy to get to Toronto's 3 top universities all in under 30 minutes. Ryerson student population is approximately 40,0000 - a 15 minute subway ride. York student population is approximately 53,000 - a 30 minute subway ride when The Eglinton Crosstown is completed in 2021. U of T student population is approximately 60,000 - a 19 minute subway ride. 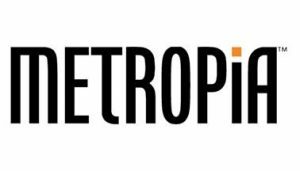 Metropia is a renowned developer of urban and combined-use communities. They’ve established a capacity to look beyond current trends to plot and construct successful and award-winning projects, by building communities of tomorrow by way of obtaining land in prime locations. Thus creating dwellings as unique as the people who call them home. 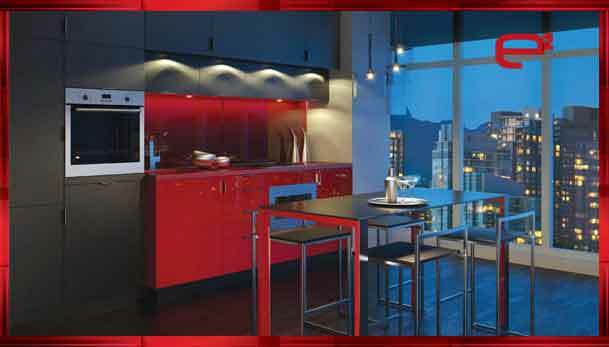 Capital Developmetns, is a real estate property developer in Toronto that devises impressive and progressive buildings. Not only do they create some of the finest residential and mixed-use buildings in the GTA, they work to shape the city’s landscape. Each one of their projects are bold choices and are completely unique to one another. A visionary builder who redefines awesome.